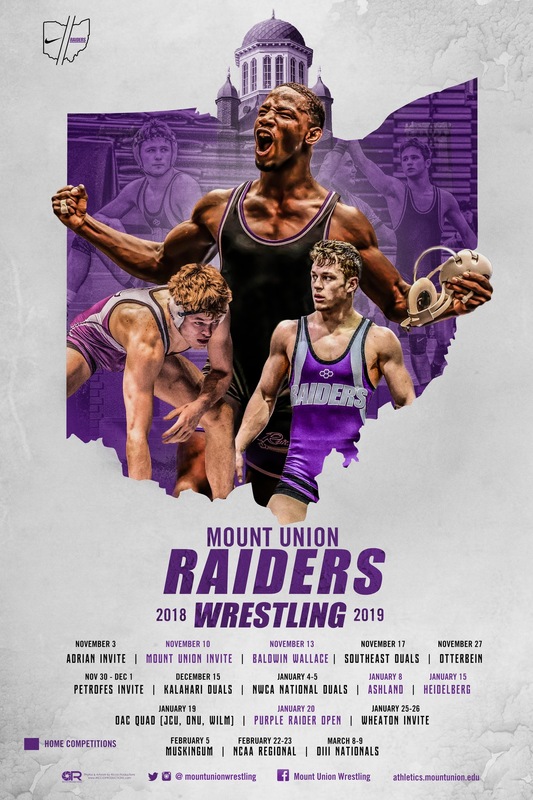 ROANOKE, Va. -- Mount Union sophomore Jordin James (Bedford) won the 133-pound title and the Purple Raiders placed fifth as a team at the 2019 NCAA Division III Wrestling Championships Saturday at the Berglund Center. Mount Union tallied 58.5 points which was just one point behind fourth place Ithaca (N.Y.) and a spot on the podium. Augsburg scored 130 points to win its 13th national title, Loras (Iowa) was in second with 66 points and Johnson & Wales (R.I.) was third with 63 points. The fifth place finish was the Raiders highest finish and sixth top-10 finish all-time. James posted a 9-7 win over Ben Vosters of Wisconsin-Stevens Point to become the program's third-ever individual national champion joining his brother Jairod at 174 pounds a year ago and Dan Bobish at heavyweight in 1992. Sophomore Antwon Pugh (Fairlawn/Copley) and senior Jairod James (Bedford) both finished as runner-ups in their respective brackets. Pugh fell victim to a series of stalling calls that ended his match against the defending national champion Ryan Epps of Augsburg at 157 pounds. It was Pugh's only loss of the season as he finished as an All-American at 37-1. James failed to defend his 174 pound title from a year ago as he fell 5-3 in overtime to Darden Schurg of Wabash in the 174-pound bout. James' only losses this season to an NCAA Division III wrestler were a pair of losses to Schurg. Sophmore Luke Hernandez (Nashport/Tri-Valley) was the Raiders fourth All-American with an eighth place finish in the consolation bracket falling in overtime to Ryan Snow of Brockport State (N.Y.) in the seventh place match.